It seems like Lady Gaga listened to our complaint about her boring black pumps and decided to bring back the crazy-high platform heels! 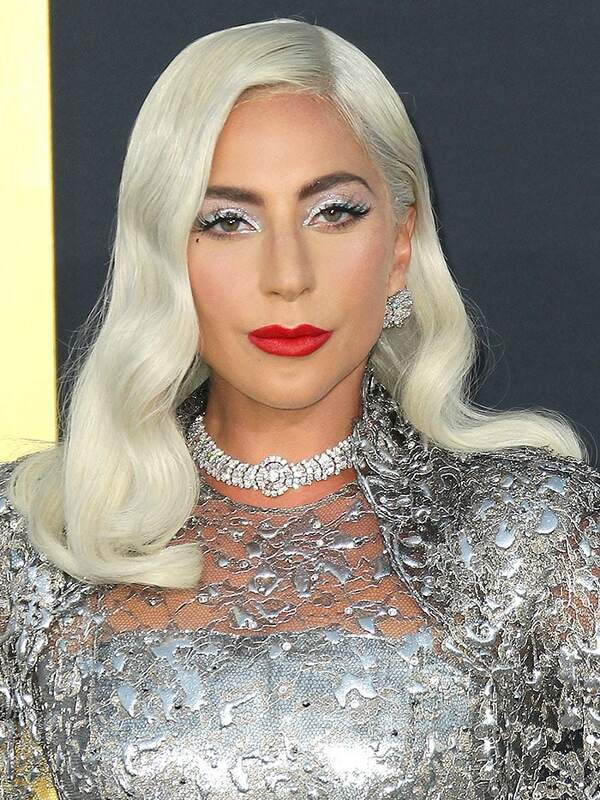 At the LA premiere of her film ‘A Star Is Born’ on Monday night, the 32-year-old singer, songwriter, and now certified actress wore chunky-heeled, silver peep-toe platforms with a silver Givenchy Haute Couture gown featuring a dramatic liquid-metallic lace cape that trailed at her back. 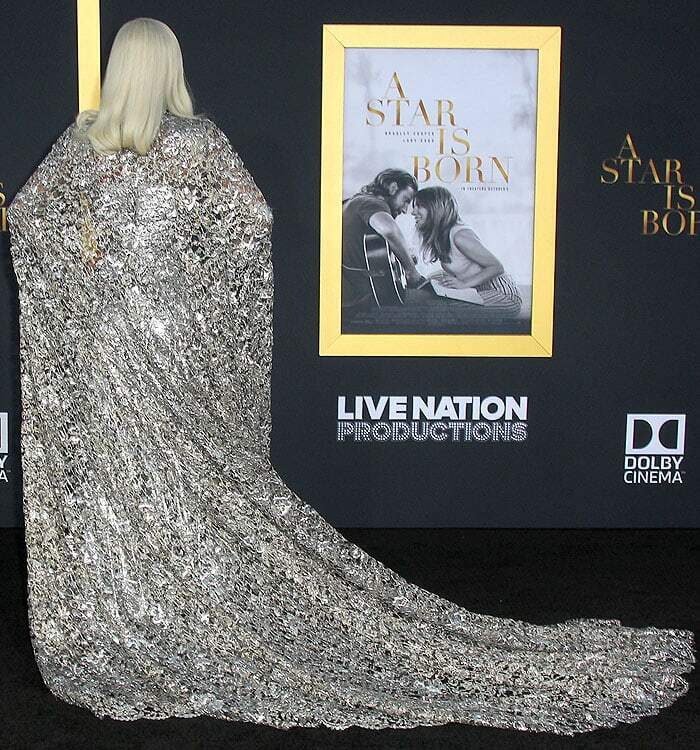 Lady Gaga wearing a Givenchy Haute Couture silver cape gown, silver platform sandals, and Bulgari jewelry at the LA premiere of “A Star Is Born” at The Shrine Auditorium & Expo Hall in Los Angeles, California, on September 24, 2018. Lady Gaga was clearly out for maximum shine that evening. She paired her already sparkly gown with dazzling Bulgari jewelry and swiped shimmery eyeshadow and silver eyeliner across her lids. 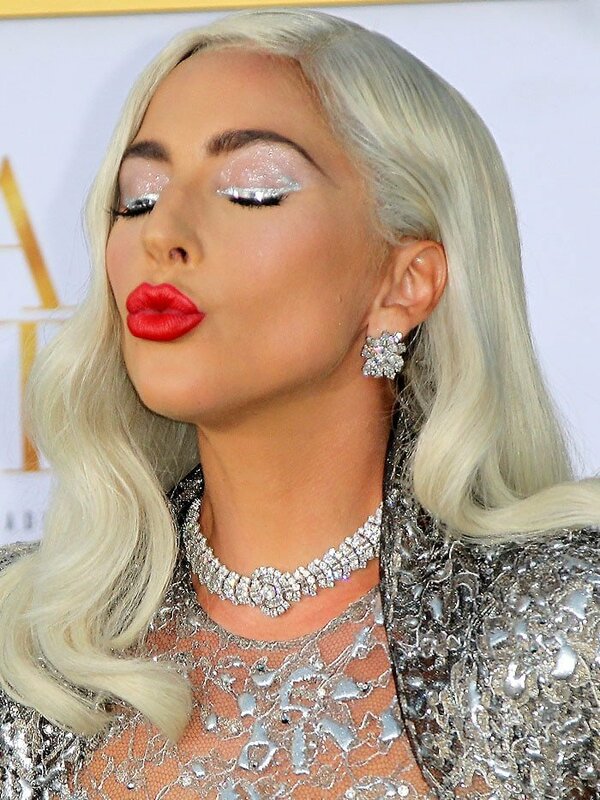 Lady Gaga wearing shimmery eyeshadow, silver eyeliner, red lipstick, and Bulgari jewelry. 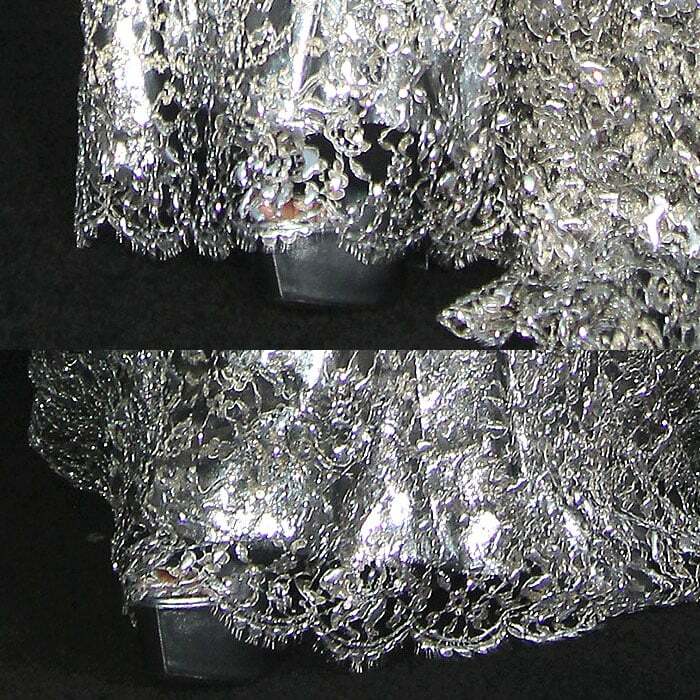 Details of the liquid-metallic lace cape of Lady Gaga’s Givenchy Haute Couture gown. 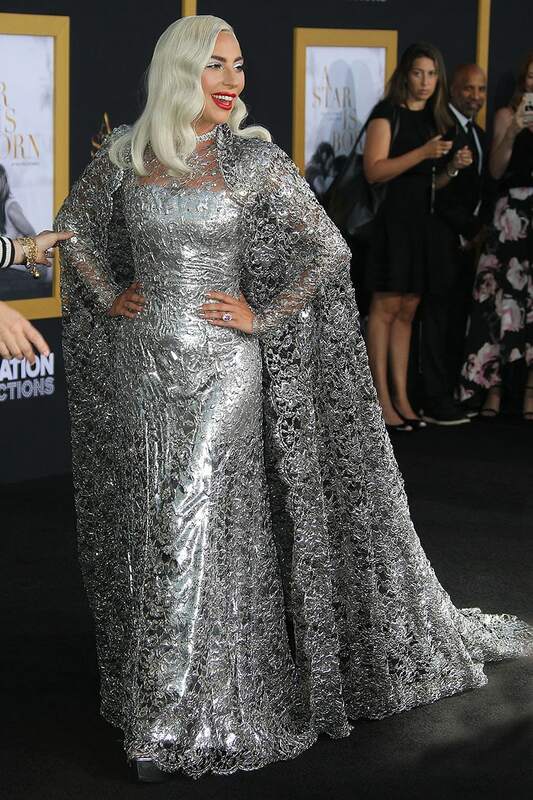 Lady Gaga’s full sparkly silver ensemble at the “A Star Is Born” LA premiere. Lady Gaga’s silver peep-toe platform sandals peeking out of the lace hem of her Givenchy Haute Couture caped gown. While we love that Lady Gaga has brought back her signature platforms, these itty-bitty 3-inch silver ones are nowhere near the league of her highest and wildest shoes. 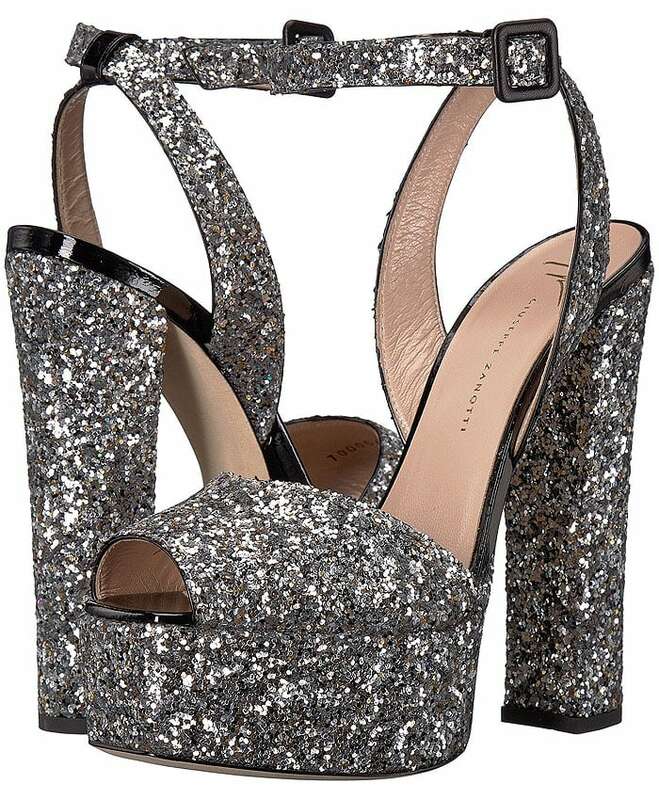 We also kind of wish that the “Million Reasons” singer chose a more glittery pair of platforms like the Giuseppe Zanotti ones below. Not only would’ve they brought out the sparkly elements of her look better, but the little gold flecks on them would’ve also matched perfectly with her platinum blonde hair.